I know I said in this post that I was excited for fall. It’s true, and yet…I’m dreading the season too. Not for it’s own sake, but for the cold winter it promises. While I tend to throw myself into fall and winter festivities, it’s largely an act of willful resistance–to the cold, the darkness, and the sense of another year gone. 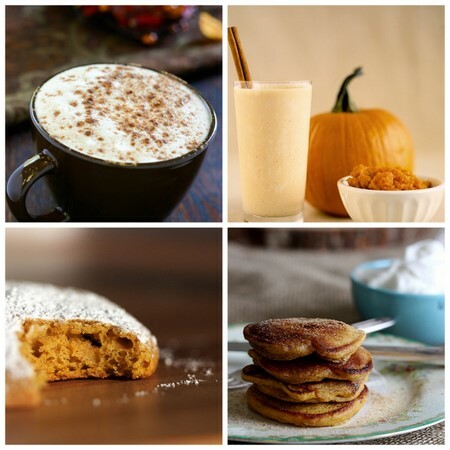 Row by row: Starbucks pumpkin spice latte copycat recipe by Angie McGowan; pumpkin shake by Martha Stewart; pumpkin chocolate chip cookies and pumpkin spice pancakes by Joy the Baker. 1. Pumpkin-based foods: Something about pumpkin and its attendant spices says fall in the coziest way possible. I’ve only ever had sweet pumpkin dishes like the ones above; this year, I’ll also try branching out into savory pumpkin dishes like this pasta with pumpkin, pancetta, and broccoli rabe. 2. Reading books under a blanket: Thanks to the Borders’ liquidation sales, and as a former bookseller & a frequent thrift store shopper, I have hundreds of unread books in my house. 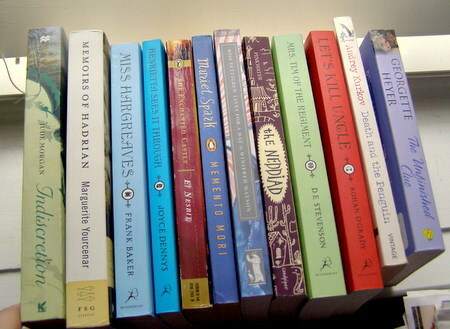 While I believe personal libraries should have lots of “to-read” books (that way you can shop your own shelves, a wonderful feeling), it’s getting ridiculous. My current goal is to get rid of 50 books by the end of October (donated, posted on PBS, or sold on Amazon). Which means lots of reading to figure out what goes. 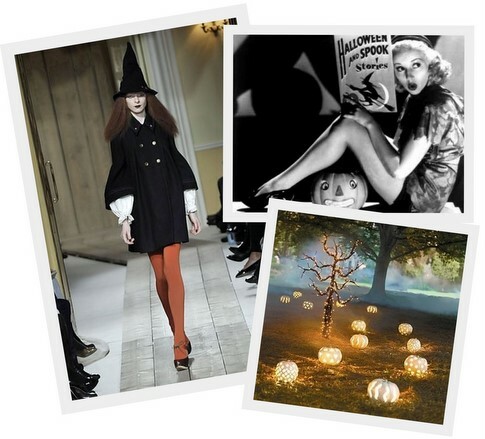 From left: Luella Bartley AW2008 witch from Vogue.co.uk (love the orange tights! ), vintage Betty Grable Halloween photo, and Grandin Road synthetic pumpkins (no longer available, but good D.I.Y. inspiration). 3. Halloween/Día de los Muertos: It’s time to announce it: next week is Halloween Week on She’s A Betty. From Monday to Friday, it will be all Halloween, all the time. I know some of you might not find that exciting, and I hear you–I’m personally not so into Halloween. But even I’ve had a blast assembling Halloween party concepts, costume ideas, vintage Halloween inspiration, scary book lists, and a few original D.I.Y. projects for the occasion. Can’t wait to show you everything! What about you guys? How are you dealing with the new season?